Fox School of Business, Temple University, B.S. Widener University Commonwealth Law School, J.D. 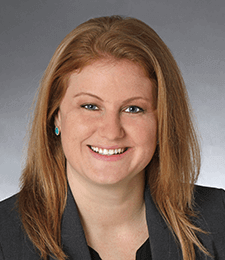 Jessica Smeriglio concentrates her practice on general liability, premises liability, auto negligence and asbestos/toxic tort claims in Pennsylvania and New Jersey. Before joining the GMR team, Jessica worked as a commercial claims specialist at a major national insurance company for six years. Her insurance industry background includes the investigation and evaluation of coverage and liability issues with auto, premises and general liability claims. This extensive insurance experience has provided Jessica with the unique ability to look at a case differently than the average defense attorney. As she has handled claims and lawsuits from both sides of the spectrum, she knows what clients need and expect. Jessica also defends some of the region’s top health systems and parlays her claims investigation skills into service that her clients find to be beneficial to their business practices from the highest corporate levels to the day-to-day ground level employees.